The above info came from Elwin Blaine Coldiron and atomofish, and was edited by yours truly (contact me). The image came from Wikipedia. Final Fantasy VII: Advent Children starts out with Nanaki (Red XIII) running with his cubs 500 years in the future. And it shows a very pretty and green city of Midgar. Then it jumps to 498 years in the past and it starts out the action-filled movie. The AVALANCHE crew are reunited again when a new threat comes. This threat are 3 spirits of Sephiroth, composed of his thoughts. They are trying to get "mother" back, which happens to be JENOVA. The three are Kadaj (Leader), Loz, and Yazoo who are the gang members. They are very brutal and actually quite young. They call everyone who has the Geostigma Syndrome their brother/and or sister, because of the JENOVA cells within their blood stream. Cloud, now a delivery man for Tifa who runs the Seventh Heaven, gets dragged into the middle of it. Him and Tifa live together with two children, Denzel and Marlene Wallace, by the way. These children aren't theirs. The gang is reunited by the appearance of Bahamut-SIN, summoned by Kadaj using the Summon Materia. Barret Wallace appears by saving Tifa and Denzel from Bahamut SIN saying "keep your mom safe" and with his modified arm he shoots at the summon. He then asks about Marlene his daughter. Yuffie appears from parachuting from the sky even though she still has air sickness. Cid then comes from the "new version of the Sierra" as he puts it. He still wields the Spear just as Yuffie still wields the over-sized shuriken. Vincent Valentine comes and asks about a phone shop (which is beyond me), then he joins in on the fighting. Denzel asks "who are they?" and Tifa replies simply "friends". When Bahamut-SIN fires a megaflare, it hitsd a building, which started to burn and fall towards Barette shooting down those shadow creatures. Cloud saves him and each of member of the group helps him defeat Bahamut-SIN including the now very dead Aeris. After some insane motorcycle skills, Cloud and Kadaj are fighting. 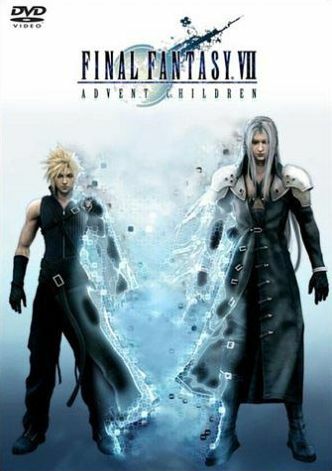 Cloud, using his new sword(s), and Kadaj, using the double sword. Yuffie says something about having his materia. Vincent tells them to leave the two men alone to duke it out. Cloud, using braver, his first limit break made Kadaj, fly back and lose his sword. Kadaj catches himself just barely and Cloud flies down (me: 0.0). After some minutes passing by, Kadaj throws the box containing a liquified JENOVA into the air, Cloud swipes it open, most likely out of reflex. Kadaj then drinks it and falls towards the ground of the very destroyed Sector 7. He changes into Sephiroth, even equipped with the Masamune. About a 6 minute and 5 second fight breaks out, which ends with Cloud using his Omnislash 5.0 version (That's his ultimate limit break and last limit break). Sephiroth says "I will not become just a memory" and changes back into a very pained and weakend Kadaj. Kadaj tries to attack Cloud, but falls into his arms instead. Aeris speaks to him and calls her "mother". Soon he dissipates into what I call pyreflies from FFX. Yazoo shoots Cloud from behind and it goes through his chest. He turns around picking up a sword and it turned into a snarl. He attacks them, after Yazoo and Loz finish speaking they unleash a huge attack at Cloud, which knocked him off the building and they too dissipated. He falls towards the ground and a white light appears with Zack and Aeris talking to him. Hands appear and he wakes up to see he was in the little pond that cures the Geostigma Syndrome. The rain is still falling, by the way. There is a lot of people in the old abandoned church. He smiles and the children are around him and being themselves. He cures Denzel after Tifa gently pushes the boy forward. When he was cured he's happy and Yuffie and Cid say "everyone jump in". Cloud looks at the entrance and sees Aeris playing with children and she stands up, smiling at him, saying "I hope you're alright now", and walks towards the light leaving with Zack waving. He nods and says "I'm home". And that is the end of the movie. There is a pointless clip at the end of the credits also. The above description came from Chellendros, and was edited by yours truly (contact me). Two years after the apocalyptic finale to the Final Fantasy VII video game, the world is finally on the road to recovery. However, its not an easy one. A widespread illness called Geo-Stigma has infected much of the populace. The heroes who saved the world from Sephiroth and Meteor have returned to normal lives and try to make a living. Cloud himself has put away his sword and currently runs his own delivery service. However, three mysterious figures attack our heroes and have their own plans involving Geo-Stigma and Jenova, which calls Cloud and company back into action to counter this new enemy. What are these mysterious men planning with Jenova? And can Cloud and his allies stop them from resurrecting the same threat they defeated in the past? The video game sensation that had enthralled the world in 1997 and gave birth to a legion of followers to its various characters had been reborn in an all-new CGI anime movie which continues where the game had ended. It has been two years. The world is rebuilding from events before when a strange illness, Geostigma, takes root, as well as the appearance of individuals looking for Jenova. Cloud Strife, Tifa Lockhart, and the rest of the original cast must reunite in order to combat this new threat to their futures.